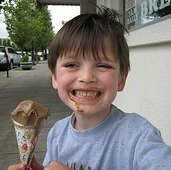 Ice cream stains are some of the best stains you can get, at least if you are measuring the amount of enjoyment you receive while getting them. 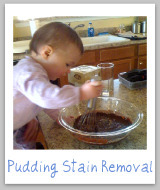 Of course, removing those stains is not quite as fun. 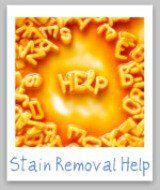 Fortunately, below are the instructions for how to remove them from your clothing, upholstery and carpet. Please note, however, that various types of ice cream contain different ingredients. 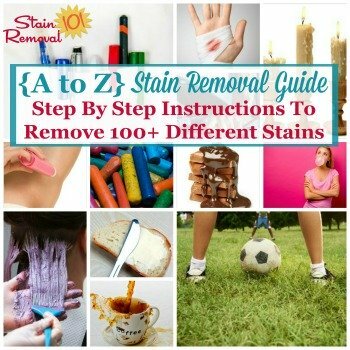 Therefore, if the general instructions below do not help you in removing the spot you should consult the A-Z Stain Removal Guide for the ingredients contained in the ice cream you spilled. Step 1: Run the fabric, inside out, under the cold (not warm or hot) water to flush out as much of the ice cream as possible. Step 2: Pretreat the stain with liquid laundry detergent containing enzymes, soaking for 30 minutes in cold water, or in the alternative pretreat with an enzyme pretreater. Hint: Do not use hot water, because this can set the stain, and also cook the protein contained within the ice cream. 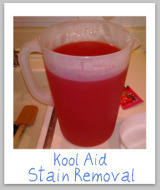 If the stain is older, you may need to soak even longer, perhaps even overnight. Step 3: Launder the item. Hint: Make sure the spot is gone after washing, but before you place in the dryer or you may set it. 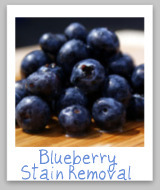 If the stain is not gone let the item air dry and pretreat again with a laundry stain remover. Repeat laundering if necessary. You may also find these home remedies for removing these spots from clothing helpful. Step 1: Blot any excess ice cream from the upholstery, being careful not to spread it further. Step 4: Next, blot at it until the liquid is absorbed. Step 5: Repeat steps 3-4 until it is removed from the upholstery. Hint: Be sure to get the upholstery only as wet as necessary to remove the stain from the ice cream. 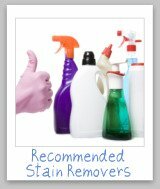 In the alternative you may try to remove the stain with a dry cleaning solvent. 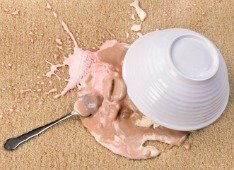 The instructions for removing stains caused by ice cream from carpet is the same as for the dishwashing solution instructions above for upholstery. However, if you don't have luck with this method you can also do something additional with the carpet stain, which is to mix a solution of one tablespoon of ammonia with two cups warm water, and use this as a cleaning solution. 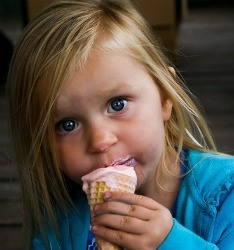 Chocolate ice cream is very popular, and also has a tendency to stain easily. 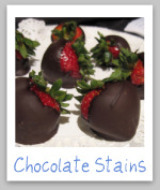 Therefore, a commonly asked question is "how to remove a chocolate ice cream stain?" An extra step for removing chocolate stains is to apply a solution of 3% hydrogen peroxide, in an eye dropper, to the stained area. In the alternative, you could apply ammonia to the spot, also with an eye dropper. With both of these methods you need to check the surface you are trying to clean in an inconspicuous location first, and make sure whichever remover you try will not harm the fibers of the cloth, upholstery or carpet. 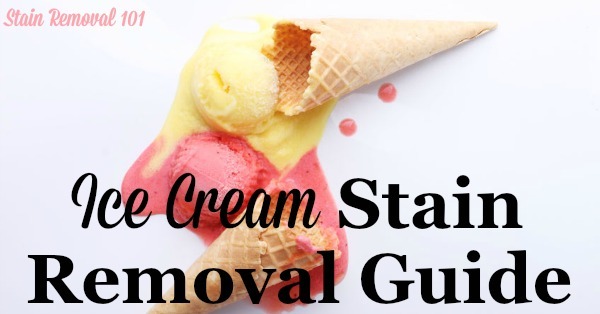 Perhaps you don't want to make your own stain remover, but instead want to use something designed to remove an ice cream stain. 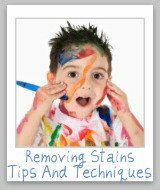 Since these are combination stains you may need to use a couple of things to get the stain out, including a product which contain enzymes for the protein part of the stain, and a product to remove the fruit or chocolate part of the stain. 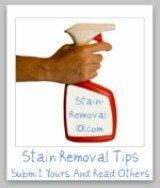 You can also share your own stain remover reviews here for other removers that work on ice cream, or any other stain. I'm always looking for more tips and ideas for how to remove spots. 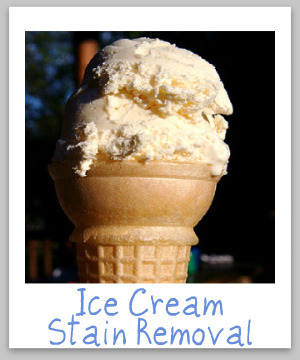 You can share your stain removal tip here, for removing spills and drips caused by ice cream or anything else.